Sketch created at the eyepiece with black Strathmore Artagain paper, white Conte’ pencil and crayon, and white color pencil. NOAA 11543 had very bright plage. The sunspots within it weren’t quite as pronounced as the other day. There was a very large filament going east to west in the SE quadrant of the solar disk. More plage located to the SW and the E-NE quadrants. 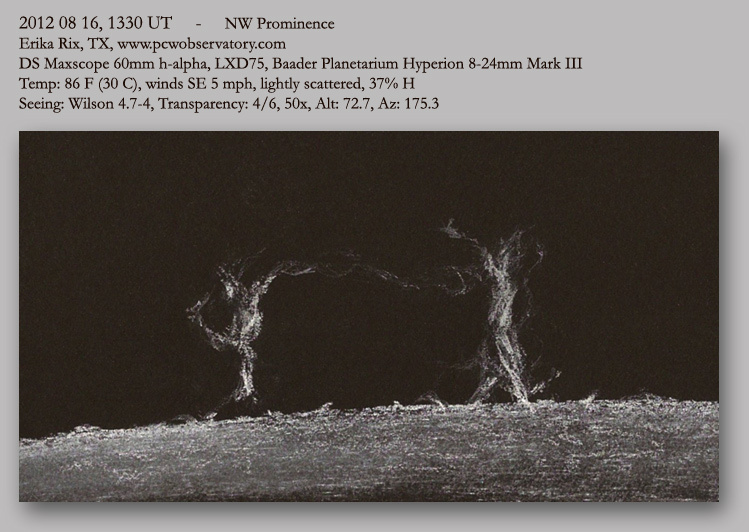 The brightest, largest prominence that I spotted was located on the NW limb and resembled two dancers joined by their outreached hands with their other hands stretched out behind them. More prominences were scattered about the limb, but to the SW, a very short, bright set of prominences were apparent. You always capture the energy of the sun in your solar sketches. Delicate, detailed work, so beautiful! Always enjoy your solar sketches.